Last week we have launched dedicated Crunchify Services site which will be very handy for users to get an idea on what all services we are providing. As you must have seen on official Slack.com site, they are using Typed.js to animate their heading with Typewriter effect which I absolutely loved it. How can I use this jQuery script, Typed.js? Download ZIP from official site. Extract it and put it under your theme’s js folder. If your theme doesn’t have js folder then it’s good idea to create one and put file under it. 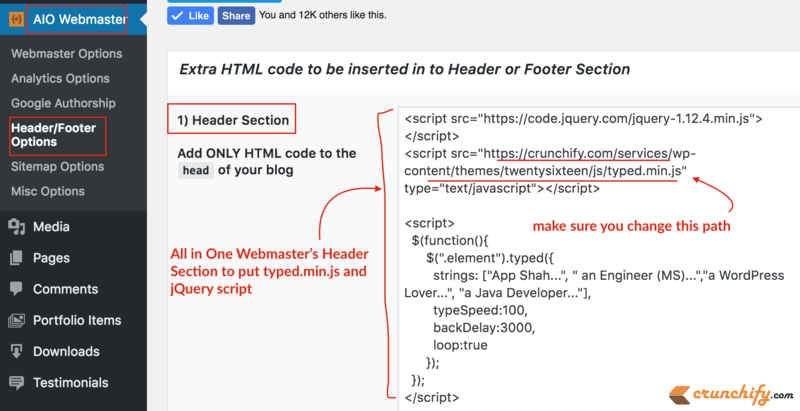 We need to load jQuery and typed.min.js file into your site’s header. In order to achieve that I’m using Header section available in All in One Webmaster plugin. Just put below code to header section and plugin will add both scripts and jQuery function into your theme’s header automatically. NOTE: Make sure to change typed.js path as per your environment. Please modify these typed.js parameter if required as per your need. NOTE: Title section part is kind of tricky and totally depends on your site theme. I would say, take a look at your theme’s template file and modify location where you want to put this typed effect. In my case, I’ve put animated effect only on Home page and removed Post Title too. It seems, WordPress doesn’t allow any hook to add HTML tags into Title. So I raised a question in Crunchify Forum if anybody know how to tweak it. Is there any way to add HTML tag to WordPress Post Title? Let me know you answer to this question. Also, if you need any custom solution then feel free to ask in above forum section and I’ll update you at earliest. Nice, i’ll post your link on my blog. Great.. Thanks Henry. Happy blogging.